Mitsubishi Electric has developed a smart, natural human machine interface (HMI) for cars by applying its Maisart proprietary compact artificial-intelligence (AI) technologies for smart mobility. After recognizing the direction that the driver is facing, the technology uses Smart Notifications to alert the driver about out-of-sight-line objects. Also, the HMI’s Natural Navigation system always responds to verbal inquiries in natural, two-way conversations regarding driving routes, etc. without the need for pressing a button or trigger words. Smart Notifications combine Maisart image-recognition technology and information from on-board video cameras to recognize potentially hazardous objects, such as cars, humans and other moving objects, located outside of the driver’s line of sight. The direction the driver is facing is recognized by a Driver Monitoring System (DMS), which monitors the driver with a camera, and compares the directions of moving objects and facial orientation to guess the driver’s blind spots, based on which it provide alerts via displays and alarms. 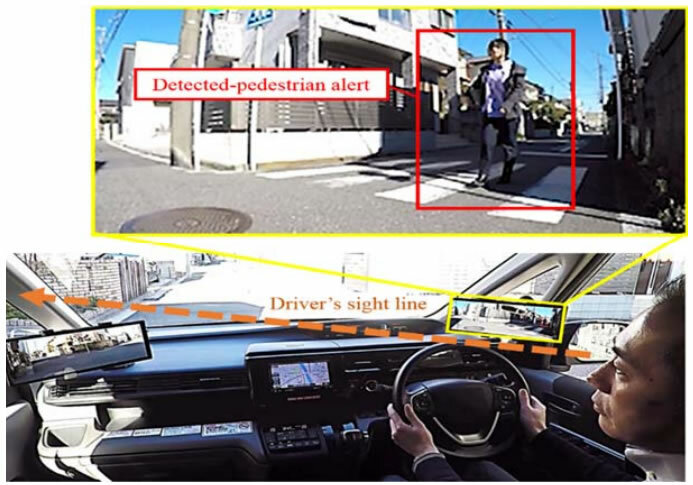 Tests conducted by Mitsubishi Electric demonstrated that the system is very effective in detecting objects and gaining the driver’s attention. The system detects when the driver starts to talk and understands voice prompts by using the DMS and a microphone array (multiple microphones that synchronize recorded sound). Significantly, the system not only recognizes speech but also distinguishes between questions intended for the navigation system and unrelated conversation with other passengers. The driver can engage the system with conversation-like dialog to provide and receive information in a highly natural manner.